Today, I will run the Charleston Half Marathon – which is a charity running event that supports the Arts in Charleston SC. We left our campground in Mount Pleasant by 6AM – for a 30 minute drive into downtown Charleston. At 36 degrees, I was expecting to be cold, bone cold while waiting outdoors 1.5 hours for the 8AM start. I was thrilled to find that the Burke Middle School was open to the runners, and all 4300 of us piled inside to stay warm. This is where I met Rosanne – a lovely lady in her early 50’s who is a cancer survivor and has run over 30 marathons and a few Iron-Man triathlons. She was quite inspiring and engaging and I nearly forgot that I was preparing to run a half marathon. With 10 minutes before the race starts, I said goodbye to my new friend – and stepped outdoors. Brrr. I was wearing too many clothes for running – but I really need to stay warm at the start. Aaah, the runner’s dilemma boils down to how much clothing to wear. But wait — the race organizers announced that the runners can drop off any extra clothing ALONG THE COURSE at the water stations – and the volunteers will bag these for you and take your clothes to the finish. Wow. This is pure luxury – and one of the reasons why I am loving smaller sized running events. 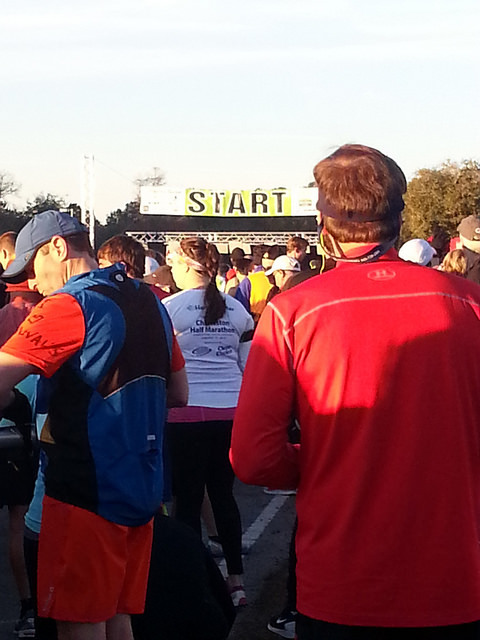 Yes there were 4300 of us running either the half or full marathon — but it still felt as if it was a small city race. I opted to stay with the 2:00 hour pace signs. Not sure if that was do-able – but I would aim for the stars today. It was sunny and beautiful, no wind, and you had a sense that the temperatures would soon rise. I wore my iVue video glasses and had a blast capturing some of the interesting sights. From the Citadel start we quickly made our way down the west side of the Charleston pennisula to the promenade / the Battery with magestic views of the Charleston Harbor. At mile 3, we turned north onto King Street and by mile 4 we were in the heart of the downtown shopping district. By now 2 water stops had passed by – and I wasn’t quite ready to give up my extra clothing. 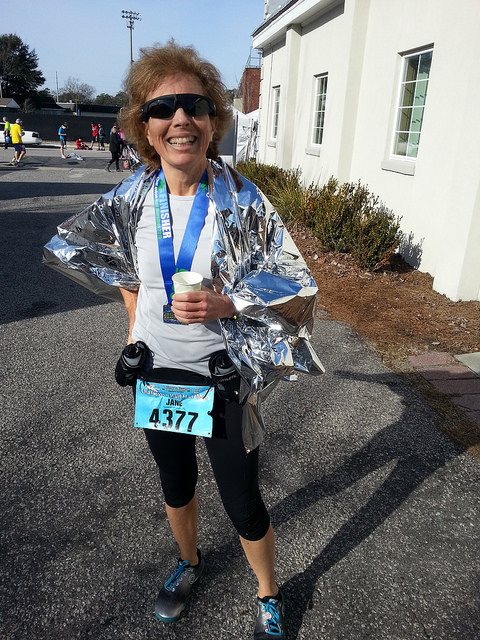 At mile 8 – I handed my favorite running vest, jacket and neck gaitor to a lovely volunteer who assured me I would be reunited with my clothing at the finish. By now the temperatures were in the upper 40’s. Along miles 8-10 – we are running in an industrial section just before reaching Northern Charleston. The roads are wide, and the running conversations have subsided. I can still see the 2 hour pacer sign just ahead of me, but I was beginning to tire. We crossed over what seemed like a hundred railroad tracks, and were now heading toward the North Charleston waterfront. This section morphed into a semi-trail run -and the scenery along the Cooper River was outstanding. My Garmin was clocking 1/2 mile further than the mile markers. This means that when I reached mile marker 12 on the course…my Garmin had registered 12.5 miles. I hoped this would be reconciled by the time I finished – I’m getting really tired now and don’t want to run an extra 1/2 mile. Update: Later discovered that the police car lead vehicle took all of us out for some additional mileage. The officials re-measured the course post-event, and corrected everyone’s time for the added distance. I sub-2 hour’d after all – 1:58:44! 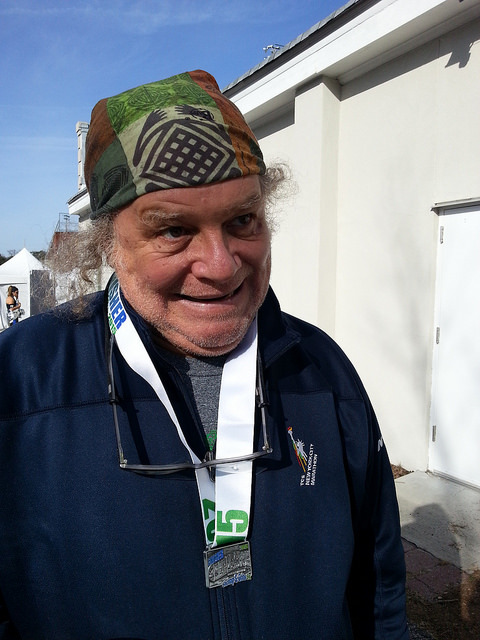 Next on the docket is to find Paddy who did his first 5K – called the Charleston Shrimp and Grits 5K. And there he was – waiting for me near the coffee truck proudly displaying his 5K medal. We enjoyed the festivities at the finish – the bands, vendors and homemade cookies. And I was eventually reunited with my extra clothing dropped off at mile 8. Great race and loved having a chance to explore Charleston in a way that would not typically happen — on roads closed to traffic and on foot. With temperatures reaching the upper 50’s, I spent the rest of the day walking along the downtown harbor promenade, mesmerized by the harbor and the history along the Charleston peninsula. Previous PostSeeking heat – A winter diversion to CharlestonNext PostCharleston Touristas! East Coast Greenway – Hellooooo Georgia!